Ittle Dew 2+ is a pleasant surprise. 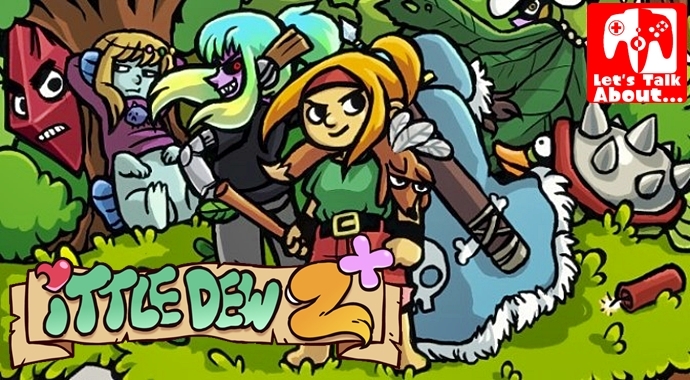 Originally released in 2016, Ittle Dew 2+ makes its way to the Nintendo Switch, and brings with it a fun homage and parody of the classic 2D Legend of Zelda titles, with a unique sense of charm and humor to boot. The top-down, dungeon-crawling adventures that Link popularized on the NES and SNES are made anew in Ittle Dew 2+, but with a few twists. Instead of the high fantasy setting like Hyrule, Ittle Dew 2+ takes place in a more contemporary, lighthearted setting. The hero is a young girl named Ittle, who is accompanied by her flying dog Tippsie. The two “crash” onto a strange island filled with dungeons and loot. Stranded on the island, the duo has to adventure through eight dungeons in order to get pieces for a new raft to get off the island (Tippsie makes a joke as to why they can’t simply make a raft from one of the many nearby trees). It’s a cute and silly premise, given all the more personality by the fact that the game’s world seems to mostly take place in a kid’s imagination (whether or not it’s literally supposed to be Ittle’s own fantasy world, I’m not quite sure). The first dungeon takes place in a pillow fort, while the second is a giant sand castle. Even a junkyard becomes a menacing dungeon in Ittle Dew 2+. I say “first” and “second,” but the truth is all but the eighth dungeon can be done in whatever order the player chooses. It has a level of freedom similar to the Zelda games that inspired it, and finding every new dungeon or location is fun in itself. Ittle starts her adventure armed with little more than a stick, but along the adventure, you pick up new weapons and items like the Force Wand (which pushes objects from a distance and deflects enemy projectiles), dynamite to destroy blocks, and eventually upgrade your stick to better weapons like a flaming sword. The personality and charm of Ittle Dew 2+ is prominent at every turn, whether it’s the weapons and items, or the nature of the dungeons themselves, Ittle Dew 2+ is a game that oozes charm. Even the equivalent of Zelda’s heart pieces are boxes of crayons. How charming is that? It’s those aforementioned dungeons that steal the show. Though the dungeons are on the short side, the puzzles they house are some of the most fun in recent memory. Each dungeon contains numerous puzzles, some of which can be decently head-scratching. Some of the best ones even have multiple means of figuring them out, and will leave the player to get creative to solve them. Unfortunately, combat against enemies and bosses isn’t quite as joyful. Later dungeons include many instances in which enemies swarm the player, which isn’t so bad in certain instances, but other times, these enemies might have contradicting patterns (one may only be able to take damage from behind, while another might require you to back them against a wall and attack from the front). When you get into situations that throw multiple different enemy types at you all at once, it can get a little hectic. Similarly, the boss fights have a considerable leap in difficulty from the rest of the dungeons that they’re featured in. While each boss has their own pattern that you can figure out in a few tries, they tend to do massive damage, meaning they often end up being trial-and-error affairs. The boss fights are never bad, but given that the dungeons themselves aren’t particularly difficult, the boss encounters may become off-putting to some players with their difficulty spikes. One other minor complaint is that the load times can be notably lengthy. They’re far from the longest load times I’ve seen, but they can take a decent chunk of time just to load a single-room cave. Still, it’s hard to complain too much about how much Ittle Dew 2+ gets right. Ittle controls just as smoothly as Link ever did in his 2D adventures, while the cel-shaded visuals only add to the game’s bountiful charm, and the musical score is as whimsical as anything else in the game. Ittle Dew 2+ may be over quickly if you only seek to finish Ittle’s raft, with each of the dungeons only taking a short amount of time to complete, with the next in line being displayed on your map at any time. But Ittle Dew 2+ has some good staying power with its sidequests. The world is littered with optional caves that contain secret items, and there’s even a dream world that can be visited for a more expansive detour. And the fact that Ittle Dew 2 leaves the first seven dungeons and side content to be done in whatever order the player chooses, the pace of the adventure can be as quick or as leisurely as the player sees fit. As for the review copy I received, it included a physical map of the game’s world and a small instruction booklet, which only make the game more appealing, as such inclusions with games are a rarity in this day and age. And surely I’m not the only one who misses instructions booklets featuring colorful artwork and character descriptions? It’s nice to see Ittle Dew 2+ revive one of gaming’s more forgotten little charms, especially when Nicalis do go all out with their physical versions, so while digital is nice, physical in this case is way better and way worth it. Ittle Dew 2 is a lot of fun. It pays both beautiful homage and hilarious tribute to The Legend of Zelda, while also having a standout personality that’s all its own. It may be a little on the short side, and some of the combat sections leave a bit to be desired. But its inventive puzzles, smooth gameplay and oodles of charm help elevate it to a real delight.